USA Today: A popular group of drugs used to slow bone loss may be putting some patients at an increased risk of fractures if taken for more than five years. 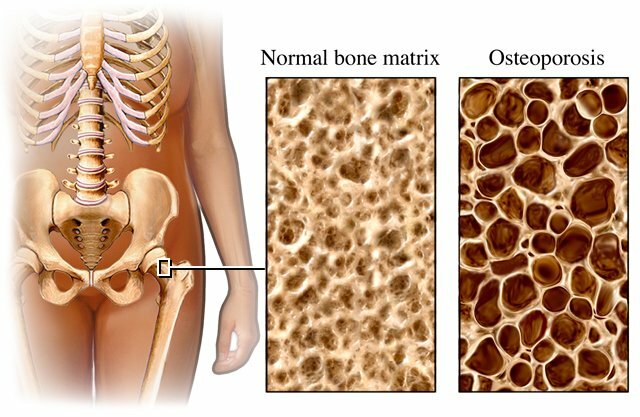 Two studies report the bones of some postmenopausal women who take bisphosphonate’s (Actonel, Boniva, Fosamax, Reclast) to ward off osteoporosis can stop rejuvenation and become brittle. The FDA’s response is to investigate the possibility of a link between osteoporosis drugs and femur fractures. They stated that they would work with outside experts to gather more information…. Your bones may be becoming denser but they are becoming denser with old bone! Old bone is brittle and when it breaks, it shatters. It’s similar to comparing bamboo and chalk. While chalk is heavy and dense, it is very brittle. Bamboo on the other hand is very lightweight but extremely strong and flexible. Most people taking Fosamax are more likely to develop osteonecrosis of the jaw if they have cancer or have been treated with chemotherapy, radiation, or steroids. When you take Fosamax, you need to stand or sit upright for a minimum of 1/2 hour so that it does not break down anywhere near your esophagus because it has been shown to cause esophageal cancer. Hyla Cass, MD noted in the Oct. 2009 issue of Taste for Life Magazine that “it is widely accepted in medical circles that these drugs build bone, but that bone is brittle and more prone to fracture than healthy bone built up through the right lifestyle choices.” Increasingly, research is challenging the concept that bone density means stronger bones that are more resistant to fracture. Here’s How You Can Build Bone Safely & Naturally! you have or are at risk for osteoporosis. The calcium myth: If all you want is healthy bones, all you need is calcium, right? That is the sum total of many people’s knowledge of bone health, and many manufacturers of calcium supplements would happily have you believe that. Here is the truth. No calcium supplement, taken in the absence of other vitamins and minerals and without proper diet and exercise, has ever been proven in clinical studies to help you strengthen bones. The best that can be said is that calcium supplementation helps slow down or stop bone loss. While slowing bone loss is a great goal, it’s a far cry from making them stronger and healthier by increasing bone mineral density. Several factors go into actually building bone mineral density or growing bone. The source of calcium is a key factor! So are a host of other vitamins, minerals and trace elements that help calcium achieve its ultimate goal. Baum’s Bone Support provides ossein hydroxyapatite complex (OHC), which includes the superior combination of the inorganic calcium lattice of microcrystalline hydroxyapatite (MCHA) within an organic protein milieu rich in naturally occurring growth factors. The OHC is combined with vitamin D3 and vitamin K2 as MK-7 (a more bioavailable form of vitamin K) to support the deposition of calcium into the bones as well as building up the organic bone matrix. Potassium citrate is also added for optimal osteo support. What are YOU doing for bone health? Leave your answers in the comments section below. Is Your Immune System Strong Enough to Fight Flu Viruses? The kids are back in school studying hard and that means a couple of things. Summer is going to be gone before we know it and cold and flu season is knocking on the door. I hope you made it into Baum’s and got the kids started on some good immune system support! Maintaining a healthy, properly functioning immune system is the key to attaining true health. The immune system fights off disease-causing microorganisms so the body can heal itself. The immune system is the key to fighting every kind of insult to the body, from a shaving nick to the countless mutated viruses that seem to flourish these days. Most healthy adults catch on average two colds a year. People who have significantly more colds and infections than that are likely to have a problem with immune function. By understanding some of the basic functions of the immune system and how they pertain to your health, you can make better choices to stay healthy. In its simplest terms, the role of the immune system is to identify things that naturally belong in the body and to destroy those that don’t belong in the body. The immune system is unlike other systems in the body . It’s more like complex interactions involving many different organs, structures and substances. Among them are, white blood cells, bone marrow, the lymphatic system, specialized cells and specialized substances. Ideally, all of these components work together to protect the body from infection and disease. The immune system has the ability to learn to identify and then to remember specific foreign invaders that it has encountered. It does this through two basic means known as cell-mediated immunity and humoral immunity. In cell-mediated immunity, white blood cells called T cells, mature in the thymus gland. The thymus gland is located behind the top of the breastbone and is a major player in the immune system. In the thymus, each T cell is programmed to identify one particular type of invading enemy. It is then released into the blood stream to search out and destroy the invader that corresponds with its programming! They attack the invader in part through a secretion of proteins called cytokines. Humoral immunity involves the production of antibodies. Antibodies are not cells, but special proteins whose chemical structures are formed to match the surfaces of specific antigens (foreign invaders such as viruses or bacteria) When they encounter their specific antigens, antibodies either damage the invading object or alert the white blood cells to attack it. Antibodies are produced by another group of white blood cells called B cells. These are manufactured and mature in the bone marrow. During development, the B cell is exposed to a certain antigen. It then engineers an antibody to match it and stores a blueprint of the invader so that it can initiate the production of antibodies in the event of another exposure. It remembers even if a long period of time lapses between exposures! B cells can match virtually any foreign invader! Fortunately, there are ways to nourish and boost your immune system to keep you healthy and protected during cold and flu season. Eating lots of fresh fruits and vegetables is a great start. Getting plenty of good sleep every night is another great way to reduce stress and restore your entire body. Don’t skip on sleep! Like acidophilus, restores beneficial bacteria to the intestinal tract to keep harmful bacteria and yeast in check. Builds immunity and fights infections with Echinacea, mushroom extracts, and more. Discourages the growth of microorganisms, viruses, and parasites. Stop in today and check out our entire line of immune products!